I did a very funny thing today. I was sitting cross-legged on the floor in my foyer giving the area rug that covers the ugly linoleum there a hair cut. I have to give the rug hair cuts once a week because it is an inexpensive loop rug from Wal-Mart, and my pug, Tink, gets her nails caught in the loops, jerks her captured foot, and rips the loops out, thus making it a string instead of a loop. It looks pretty ratty after that, so I cut the strings down to the level of the loops, and wha-la!…a new rug. I guess it is not really that funny to most people because I am sure everyone has cut stray strings off of something before, whether it be a rug or a sweater, or both. It is just funny to me, because as I was sitting there, I realized how wonderful it is to be able to sit on the floor giving my rug a haircut. Now, maybe I should get out more if this is the sort of thing that I am thankful for, or maybe, I was once a frazzled working woman who still had to be a housewife and mother with no time to herself. It’s the latter, and what I am really thankful for is the time that I have to cut the rug (the rug, not a rug). It’s ironic really, because before I shut down my business, devoted myself full-time to homeschooling my children, and gave up the second income, I would never have even thought to continuously give my rug a haircut. I would have ruthlessly ripped it up from it’s spot on the ugly linoleum floor, replaced it with $100.00 rug from T.J. Maxx, and probably replaced that ugly linoleum for tile. Total cost: $400.00. Total time away from my family to recoup the money it would cost for that scenario? 16 hours (8 hours per day for 2 days) . Doesn’t sound like much of a sacrifice? Skip to the end of your life and I’ll ask you this question: If you could have 2 days to do anything you would like, would it be working for a rug and 20 tiles, or spending that precious time with your children? Yeah, drastic, I know. It is not just the rug and the haircut though, is it? Quitting work was hard, but letting other people raise my children was harder…..I don’t work anymore. 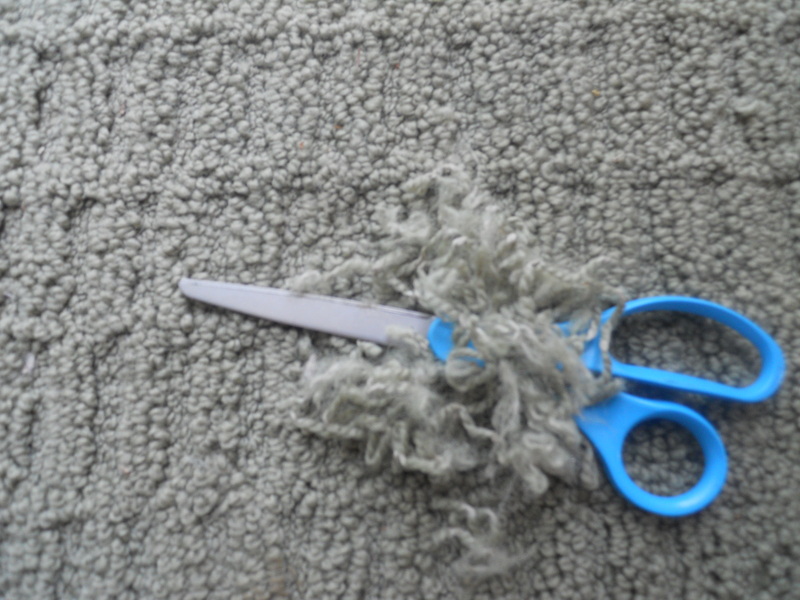 Not having the money to replace a $16 rug from Wal-Mart is hard, but not having the $16 to take my kids on a field trip is harder…..I’ll give the rug a haircut, ignore the stupid linoleum and use the $16 to take the kids to the local farm where we can learn how to spin wool and make our own rug!